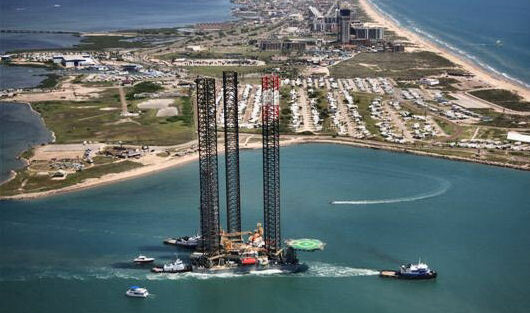 The new jack-up drilling rig OFFSHORE COURAGEOUS was towed from its construction yard in Brownsville, TX, to the load-out location in Ingleside, TX. There the rig was towed to the submersed heavy-lift vessel WILLIFT FALCON for loading. For the offshore tow, 2 ocean going tugs were used. For the maneuvering through channels and loading, a large number of local harbor tugs were deployed. Detailed drawings were made for each phase of the tow, showing where each tug was to be positioned. Photograph courtesy of Signet Maritime Corporation. Channel passage, offshore tow, Corpus Christi Channel and La Quinta Channel passages, and loading.